The summer holidays have arrived and, down here in Devon, so have the crowds (other words are available but we do try to be as welcoming as possible). Pasty sales have multiplied as have journey times (no more ‘popping’ anywhere), traffic jams (I wonder if traffic marmalades would be more palatable) and numbers of people in the sea (not swimming but standing). There are other things in the sea too, some of which only really appear in the summer. Here are my Tuesday’s Ten things you might find in the sea. Jellyfish – these have tentacles, float in a disconcerting manner and have no control over where they are going. They also sting (most of them). Plastic bags – It would appear that more plastic bags find their way into our waters at this time of year than any other. Floating plastic bags look a lot like jellyfish to this Blonde swimmer. Bubbles – Once you start noticing, it is surprising how many bubbles you produce as you swim along. Bubbles look a lot like jellyfish to this Blonde swimmer. 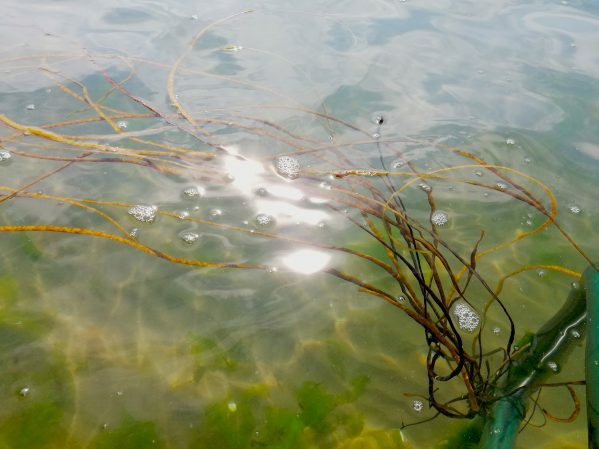 Floating seaweed – I differentiate here between floating (usually bright green) seaweed and hanging seaweed (it is hanging upside down of course). Floating seaweed feels a lot like jellyfish to this Blonde swimmer. White stones – White stones show up more under the water than stones of other colours. They also move around and can be there one day and gone the next. White stones look a lot like jellyfish to this Blonde swimmer. Portuguese men of war – Luckily these unwelcome but disconcertingly beautiful invaders do not appear to have developed a taste for South Devon and have all gone off elsewhere this summer. Portuguese Men of War look a lot like jellyfish to this Blonde swimmer (but are not). Sunlight – Watching the sun’s rays from underwater is a truly mesmerising experience but, catch one in your peripheral vision, just as you turn your head to breathe and… yep, they look a lot like jellyfish to this Blonde swimmer. Moonlight – I haven’t done any night swimming recently. There is always the risk that the moon’s reflection might look a lot like jellyfish to this Blonde swimmer. Tow floats – Tow floats are a great idea if you want to be visible or take your picnic to the nearest rock (not Hanging Rock) in order to avoid the crowds. Tow floats are usually orange and don’t look much like jellyfish unless you are this Blonde swimmer. Weever fish – Weever fish are tiny but don’t like people standing on them and deliver a painful sting. There have been weever fish stings aplenty down here in the South West this summer. My advice would be to wear shoes in the water or swim… that way you won’t stand on anything! Weever fish are not anything like jellyfish, even to a Blonde swimmer. Thank heavens for 10 – I was beginning to think you had a jellyfish complex.